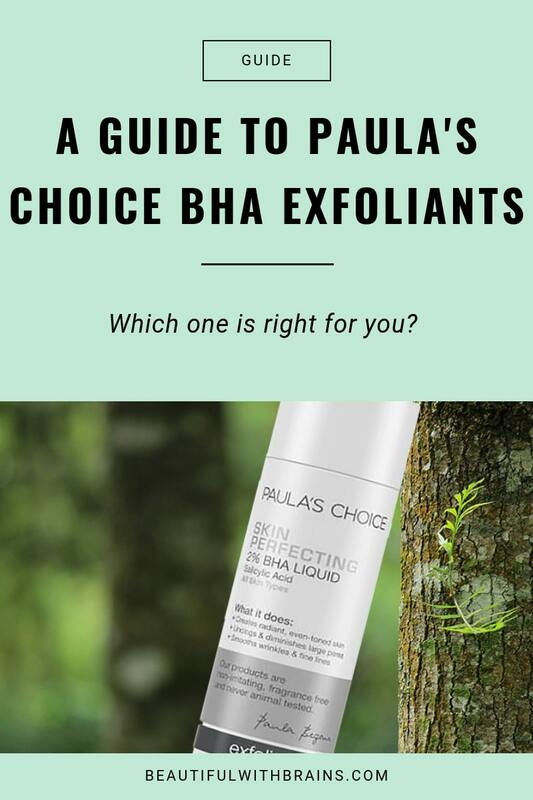 Paula’s Choice BHA Exfoliants Comparison: Which One Is Right For You? Remember the days you couldn’t find a BHA exfoliant to save your skin? Paula’s Choice took care of that – with a vengeance. Last time I counted, the brand makes 12 BHA exfoliants. 12! How do you even begin to pick one?! Talk about skincare overload! Makes you want to close your eyes, grab one at random off the shelf and hope for the best. What The Heck Are BHA Exfoliants And Why Should You Use Them? Beta Hydroxy Acids (BHAs) are a family of exfoliants. The only member that has a job in the skincare world is salicylic acid. It exfoliates skin: it dissolves the “glue” that holds skin cells together on the surface of the skin so they slough off instead of getting trapped in the pores. This also makes skin smoother, brighter and more even-toned. It unclogs the pores: it’s oil-soluble, so it can get inside the pores and remove all the excess oil, dead cells and other gunk that’s clogging them up and giving you whiteheads, blackheads and pimples. It has anti-inflammatory properties: it reduces the inflammation and redness that always comes along with pimples. I can’t stress this enough: if you have oily or acne-prone skin, a BHA exfoliant is a MUST. You’ll never gonna get rid of those annoying breakouts without it. If you have any other skin types, AHAs are more suitable for you. I’ve already written about how to choose the best exfoliating acid for your skin type and a comparison of all Paula’s Choice AHAs Exfoliants. The only exception? If you have dry, normal or sensitive skin that breakouts during your period, adding a BHA exfoliants in the days before it can help. Check out my guide on how to deal with hormonal acne. How much salicylic acid is here? : 1%. What is it good for? : mildly clogged pores, redness and sensitive skin. What else is in the formula? : soothing ingredients, like green tea and liquorice extract, to reduce redness and irritation. What’s the texture like? : lightweight lotion. Who should use it? : oily AND sensitive skin. How much salicylic acid is here? : 2%. What is it good for? : clogged pores and inflamed skin. What else is in the formula? : green tea to prevent wrinkles and soothe skin. It has a lower pH to provide stronger exfoliation that the Regular Strength formula. What’s the texture like? : lightweight, silky fluid texture. Who should use it? : anyone with stubborn blackheads and inflamed pimples. What is it good for? : clogged pores, mild acne and redness. What else is in the formula? : soothing ingredients, like allantoin, to reduce redness and inflammation. It has a higher pH to provide gentler exfoliation than the Extra Strength. What’s the texture like? : liquidy, lightweight texture. Who should use it? : anyone with mild acne and blackheads. How much salicylic acid is here? : 4%. What else is in the formula? : antioxidants to prevent premature wrinkles and soothing ingredients, like oats, to calm down inflammation. What’s the texture like? : lightweight serum. Who should use it? : anyone who tried lower doses of BHA without seeing results. How much salicylic acid is here? : 9%. Use it as a spot treatment only! What is it good for? : very clogged pores, stubborn blackheads, milia seeds and patches of dry skin. What else is in the formula? : soothing ingredients, like oats, to reduce redness and irritations. What’s the texture like? : light serum. Who should buy it? : anyone who’s already tried everything for clogged pores, blackhead and milia without results. What is it good for? : clogged pores, smoother skin and dull complexions. What else is in the formula? : humectants to hydrate skin, soothing ingredients to reduce irritation and peptides to improve skin’s texture. What’s the texture like? : lightweight, liquid texture. Who should use it? : mature dehydrated oily skin. What is it good for? : enlarged pores and dark spots. What else is in the formula? : hydroquinone to fade away dark spots. What’s the texture like? : sheer, lightweight gel. Who should use it? : oily skin with dark spots – unless you have dark skin. Check this post for alternative skin-lighteners for darker skintones. Related: Is Hydroquinone The Best Treatment For Dark Spots? What is it good for? : clogged pores and white bumps on the skin. What else is in the formula? : antioxidants to help prevent premature aging. What’s the texture like? : liquid-to-foam. Who should use it? : oily, mature skin and anyone with white bumps on their skin. How much salicylic acid is here? 2%. What is it good for? : clogged pores on arms, legs and the rest of the body and smoother skin. What else is in the formula? : antioxidants to fight premature wrinkles (your body needs them too!). What’s the texture like? : lightweight, fast-absorbing lotion. Who should use it? : anyone with body acne or keratosis pilaris. What is it good for? : clogged pores, uneven skintone and dull complexion. What else is in the formula? : a sprinkle of antioxidants to prevent premature wrinkles. What’s the texture like? : water-light gel. Who should use it? : anyone with oily or acne-prone skin who prefers gel textures. What else is in the formula? : humectants (they attract water from the air into the skin) to hydrate and green tea to soothe and fight free radicals. What’s the texture like? : Liquid, slightly tacky, leaves skin a little shiny. Who should use it? : best for oily or acne-prone skin that’s also dehydrated. Related: What The Heck Are Humectants And What Are They Doing In My Skincare Products? What is it good for? : unclogged pores, dull and rough complexion, and dehydrated skin. What else is in the formula? : humectants to hydrate skin and antioxidants to prevent premature wrinkles. Who should use it? : mature, dry and acne-prone skin. If oily skin and breakouts are your only concerns, go with the Clear line. It’s made for this. If your oily, acne-prone skin is also dry/dehydrated, opt for the Skin Perfecting line. It’s hydrating and exfoliating at the same time. If you have oily, mature skin, try the Resist line. It’s loaded with antioxidants to prevent wrinkles. If your oily skin is sensitive and easily irritated, the Calm Redness Relief line is your best option. All those soothing ingredients help you calm down irritations and redness. Do your skin a favour and start with the lowest concentration you can find. Only if that’s not enough to get rid of those stubborn blackheads or white patches of skin, upgrade to something stronger. By this point, you should have narrowed down the choice to only a handful of exfoliants. Now, it’s all about personal preference: do you prefer a lightweight gel or a silky lotion? A toner or a serum? Figure that out and you’ve found your exfoliant. I hope you’ve found this Paula’s Choice BHA Exfoliants comparison useful. Leave a comment below and let me know which one you’re going for! Is This The Most Instagrammable Eye Contouring Brush Ever? Thank you for this. I’ve been using Skin Perfecting 2% BHA Liquid (my first Paula’s Choice product) for two months now, and am not seeing any results at all. The blackheads have not moved or lessened at all. I don’t have glaring or very pronounced blackheads but they are there. A pimple also sprouted a couple of days ago. I’m so disappointed that for some reason my skin doesn’t like it. I have another bottle (bought at a sale), which I’m giving to a friend who may have better luck with it. JD, mmmm if the blackheads haven’t disappeared you may need a higher dose. There’s always the chance they’ve become so hardened, you’ll need manual extractions. I was about to buy the skin perfecting 2% BHA Liquid Exfoliant but then I noticed in the ingredients the Tetrasodium EDTA, isn’t it very bad? Elisa, depends on whom you skin. It’s derived from formaldehyde so that’s enough for the natural brigade to make a fuss about it. Scientists found it’s safe in low concentrations in cosmetics as it can’t penetrate skin anyway. I think I am going to skip it , I prefer to avoid this ingredient… what could it be another good option for dry skin but a bit oily in the t zone just to get rid of the very heated blackheads and big pores on the nose and chin? Better a BHA alone to put only in the t zone (and an AHA on different days) or an exfoliant that contains both BHA and AHA ? Any particular brand? Thanks so much, I find your articles very interesting! Elisa, both are good options. One doesn’t work better than another, it’s what works best for your lifestyle. Are you ok with using two products or do you prefer the convenience of having both in the same product? Drunk Elephant Glycolic Night Serum and Nip + Fan Glycolic Fix Gel have both. The latter is cheaper, but it has a tendency to peel. Is it the T.L.C. Framboos™ Glycolic Night Serum? I cannot find it, maybe in the US has another name. Elisa, yes T.L.C. Framboos™ Glycolic Night Serum. The Honeymoon Glow isn’t a bad product but it probably won’t work as fast because it uses a salicylic acid derivative. Thank you for answering, you are so helpful with all of the information you provide with your blog! I will probably buy the drunk elephant but it’s soo expensive! Elisa, my pleasure! Have you considered getting a mini set so you can try a few products without spending a fortune? I didn’t know that they make a mini set, great idea! !